Free woodworking plans for the bathroom. Find plans for vanities, cabinets, dry sinks, and more. Useful free plans for your next bathroom woodworking project. 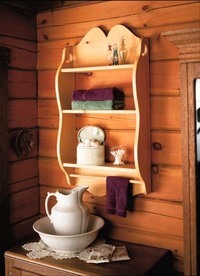 3 Free Woodworking Plans found in the "Bathroom" Category. This plan is from Shopsmith-Hands on and it is a dry sink. These plans are well done with lots of detail. This free woodworking plans is for a bathroom vanity made from recycled wood that would be normally discarded. The plan has an excellent drawing that can be printed out.